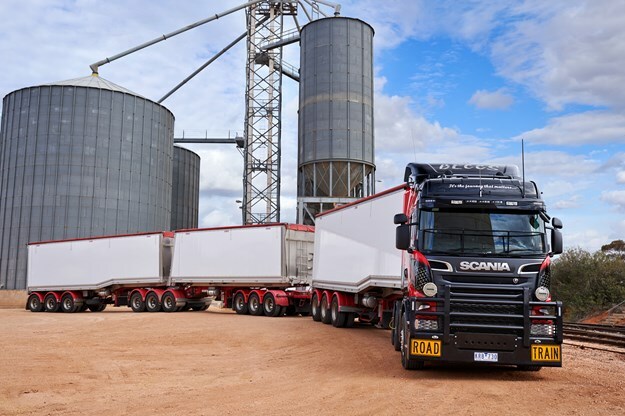 Ken Beggs’ 2017 Scania R730 attracts plenty of attention when he carts stockfeed on his regular run between north-west Victoria and southern Queensland. "At service stations, nearly always someone comes up to admire it," says Ken, 65, who travels with a Jack Russell named Russ. "It’s curious the number of people that have said to me, ‘Gee, I didn’t know you could make a European truck look good’." In Victoria Ken attracts added attention because of his AB-triples – a combination rarely seen in this state. The Scania carts a payload of between 65 and 70 tonne, so the 730hp doesn’t go to waste. 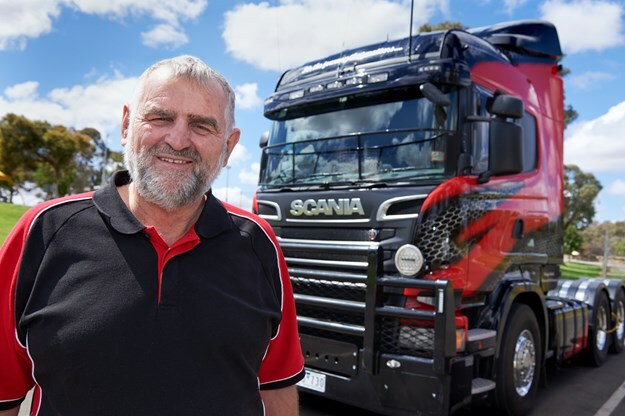 Ken lives in Mildura, Victoria, and bought the truck from Paul Riddell at Scania Adelaide. It was painted by Mikutta Heavy Vehicle Refinishers and then taken to Troy Craddock of ND Refinishers for the artistic airbrushing. "I like to fly under the radar so plain white is what I like," Ken says. "But this is my last truck and my boys were saying, ‘Dad, you’re boring. Make it look nice’." He was happy to splash out on paint, but refused to settle for ‘old-fashioned’ pinstripes. Ken’s concept was to carry the honeycomb design of the grille onto the truck. He is thrilled with the way ND Refinishers interpreted his ideas. A former banker, Ken is even more excited about the practical, cost-saving features of his rig. He has a tyre inflation system on the prime mover and trailers. They run on 90psi when he’s loaded. 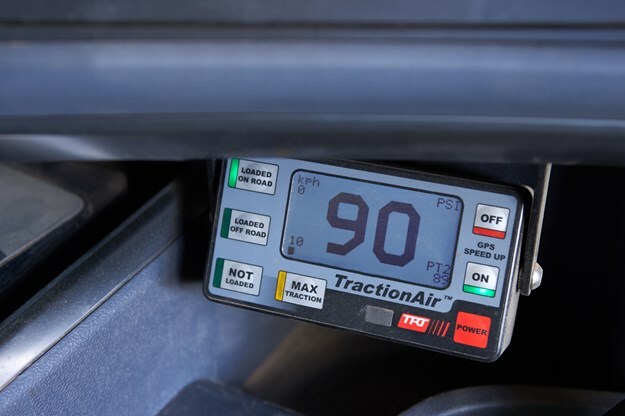 And at the push of a button he can drop them to 55psi for empty travel, or 35psi if he is in boggy terrain – all from the comfort of the driver’s seat. If he forgets to press a button to reinflate them, they automatically increase pressure when his speed reaches 20km/h. "Over some years it certainly is quite a lot of saving. I’ve gone from about 220-250,000 [km] per tyre to up to over 300,000 now." Safety features on the Graham Lusty trailers include handles, steps, ladders, reversing cameras, electronic braking, anti-lock braking and rollover stability. Ken says life is about the journey, not the destination. That’s why ‘It’s the journey that matters’ is painted on the Scania. The truck also displays the names of two Victorian towns: Mildura, where Ken lives today; and St James, where his journey began. As an 18-year-old Ken invested in his own farmland at St James, near Yarrawonga, and began his trucking career carting hay and stock. By the time he was 21 his farm and contracting business employed four people. From 1976 to 1984 he supplemented the farm income by carting freight between Melbourne and Sydney in a Louisville and G88 Volvo. He shared the work with his brother Graeme Beggs, meeting at Benalla for changeovers. Some drivers look back at this era as ‘the good old days’ but Ken remembers the rough roads, narrow bridges and tragic accidents on the Hume Highway. "It was always mayhem on the roads. There was always carnage. There was just so much death and destruction." Back on the farm the 1970s and 1980s were cruel – floods, drought, and a devastating motorbike accident. When Ken was 36 he left the farm to study Agricultural Science and Accounting at university. "And then at the end of all that, I became a banker." Ken held several senior management positions before leaving the bank industry 10 years ago. In 2008 he bought a Volvo 520 and founded Beggs Bulk. Trucks had become safer and more comfortable during his 20 years away from the transport industry. He replaced the 520 with a Volvo 540 Globetrotter which travelled 1.2 million kilometres on its original motor before he updated to the Scania last year. The Scania has averaged 1.5km/l compared to 1.54km/l for the Volvo 540. Ken admits he was hoping the R730 would be more fuel efficient, but acknowledges his Scania produces 190hp more than the Volvo 540. "You'd expect to use a bit more fuel, I guess." Ken believes owner-drivers should free themselves from "sheep-mentality" allegiance to North American trucks. "I don’t have that restriction, so I can go with something that’s cheaper to run." He has noticed that many large national fleets are opting for simpler trucks. "They’ve got a European truck with no bling on it – a basic truck that’s much more fuel efficient. They’re cutting their stuff to the bone to get the work." And yet, Ken says, some of the subcontractors driving for these big companies are buying more expensive trucks and customising them in ways which don’t improve efficiency or safety. Ken doesn’t want chrome, stainless steel, fancy lights or other truck bling on his Scania. He is glad he doesn’t have to spend time cleaning a blinged-up American truck. "There’s nooks and crannies all over the place. It takes you hours to wash the thing." He prefers the smooth lines of European cab-overs. "You just run a broom over it, and water. There’s no nooks and crannies." He even had the bullbar powder coated so he doesn’t need to polish it. Ken still carries injuries from the motorbike accident, so easy access to the cabin is essential. He says the design of the Scania’s steps, and the way the doors open to right angles, make it easy to climb in and out of the truck. 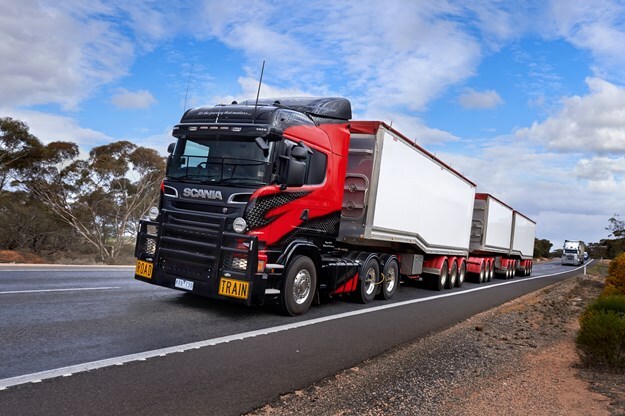 Marshall Group, Mildura, maintains Ken’s truck under a Scania Maintenance Program. Ken likes the program because it turns the unknown variable cost of servicing, maintenance, mechanical repairs and breakdowns into the fixed cost of a monthly fee. Of course, life on the road has a way of throwing unexpected costs at you. Kangaroos, for example. Ken says he’s had a kangaroo collision on almost every trip to Queensland. So he invested in a high-tensile aluminium bullbar from Chris Barron Engineering which has proven its worth. "Three or four nights before a full moon, [kangaroos] get very active. They move around and cross the road very fast. On the night of the full moon they’re not too bad." And they are quieter after the full moon, he says. Ken’s accounting degree and banking experience give him a unique perspective. "You need to know absolutely every single cost. You need to know daily, weekly, monthly, annually." He is critical of the Transport Workers Union’s (TWU) Safe Rates campaign and says owner-drivers should spend less time complaining about rates and more time managing their costs. "If these guys got rid of their Kenworths with all the flash lights and chrome and bells and whistles, and actually bought themselves a much more fuel-efficient, cost-effective European truck, they could actually compete and actually make money. "And that never ever gets reported. That never gets followed up in your paper [Owner//Driver]." Ken has crunched the numbers and fears he will be worse off if the TWU’s Safe Rates campaign is successful. He believes owner-drivers should fight to retain the right to negotiate rates which suit their individual operations. And he doesn’t believe the Safe Rates proposal will make trucking safer. "It’s got nothing to do with making people better off. It’s about putting owner-drivers out of business, and it will break me within a fortnight." This article also appears in the December 2018 edition of Owner//Driver.